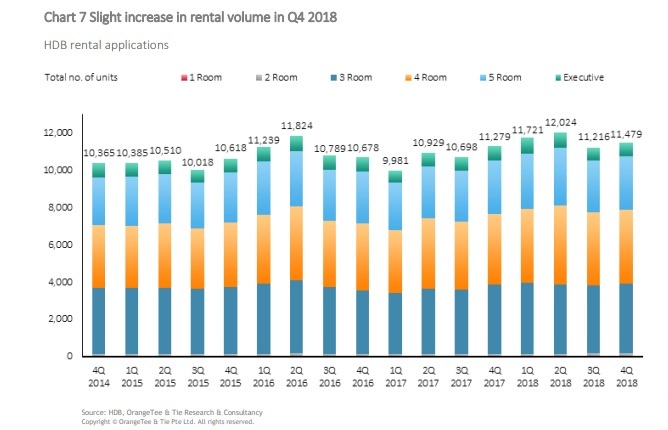 Demand for HDB resale flats remained resilient last year as the total resale volume rose 4.6 per cent year-on-year (y-o-y) to 23,099, reaching a new high since 2012 (Chart 1). 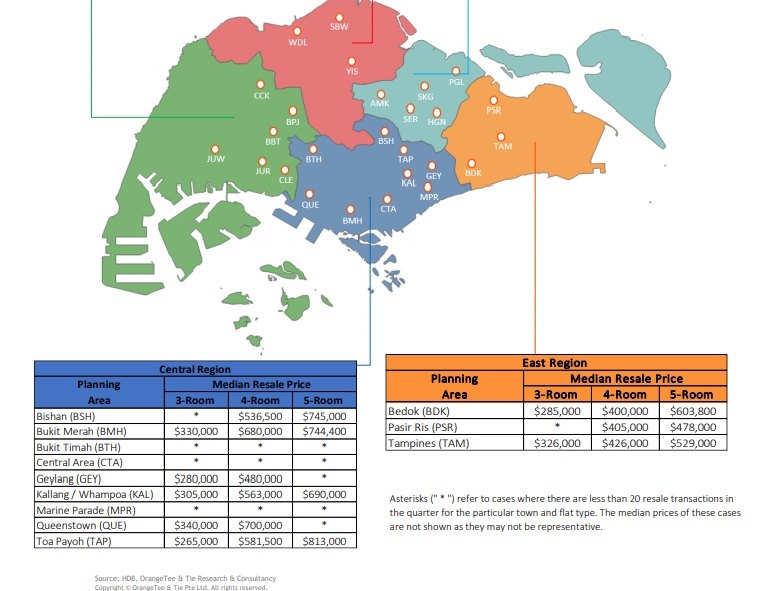 Tampines, Bedok and Ang Mo Kio in the mature estates and Jurong West, Yishun and Woodlands in the non mature estates had the most transactions (see page 5) last year. Sales volume of standard flats rose the most for Punggol (47 per cent y-o-y), followed by Sengkang (23 per cent). These numbers are poised to rise further this year (see page 6) as more than 6,000 and 4,000 flats will be reaching their Minimum Occupation Period (MOP) this year in Sengkang and Punggol respectively. With more than 26,000 HDB flats reaching their MOP, new resale and rental hotspots could emerge this year (see page 9). Prices continued to see weakness quarter-on-quarter (qo-q) as the HDB resale price index edged down 0.2 per cent in the final quarter of last year, making for a full-year decrease of 0.9 per cent. The fall in prices had not been as significant as the previous year (-1.5 per cent) as there were more transactions of newer flats which have just reached their MOP and fetched good prices. 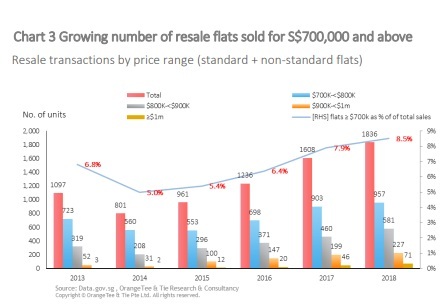 More flats were also being sold for ≥ S$700,000 last year, with a record 71 flats transacted above S$1 million, and they constitute 15.6 per cent of the total resale transaction value last year (see page 4). Prices were hovering between -0.2 per cent and 0.1 per cent percentage change per quarter from Q2 to Q4 2018, indicating that prices have largely stabilised for the past three quarters. 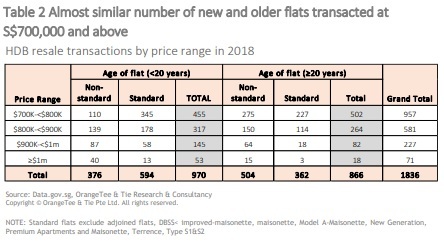 The widening price gap between newer and older flats may turn the tide in favour of owners of older flats as some buyers may be drawn to their price affordability, larger-living spaces and upgrading potential once the government announces their plans for the Voluntary Early Redevelopment Scheme and Home Improvement Programme. We estimate that 22,000 to 23,000 HDB resale flats may be transacted and prices may dip marginally by 1 to 2% this year (see page 10). 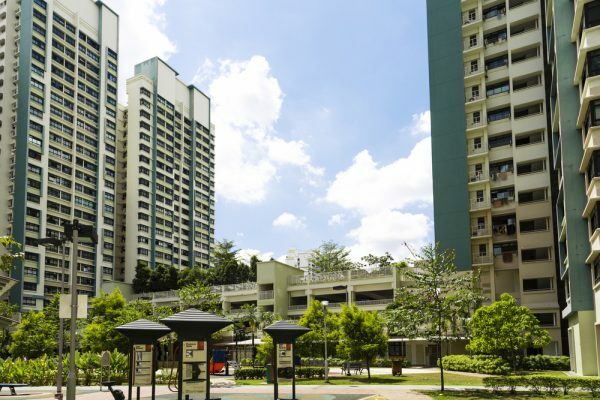 HDB resale flats being sold at ≥S$700,000 constituted 15.6 per cent of the total resale transaction value last year, a remarkable increase from the 0.4 per cent in 2008. This indicates that the proportion of flats being sold at higher prices had grown exponentially in recent years. The proportion of HDB resale flats being sold for S$700,000 and above has been climbing steadily over the last four years. 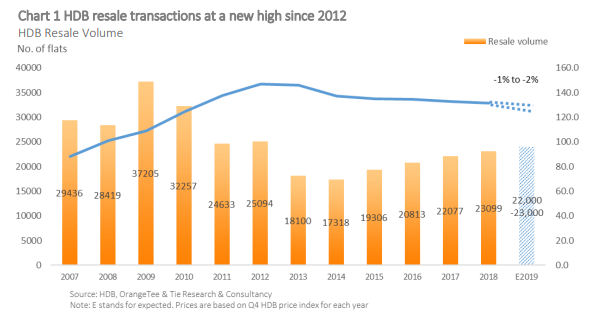 According to data.gov.sg, 1,836 flats or 8.5 per cent of all HDB resale flats were transacted ≥ S$700,000 last year (Chart 3), reaching a record high since 1990. 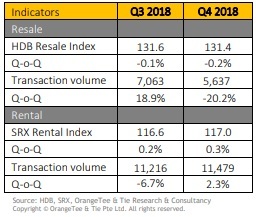 These flats constituted 15.6 per cent of the total resale transaction value last year (Table 1) The increasing number of HDB flats being sold at higher prices indicates that selected market segments or flat models are still performing well. Of the 1,836 flats transacted ≥ S$700,000, 52.1 per cent (956 units) were standard flats (i.e. improved, model A, multi generation, new generation and standard models), while the rest were non-standard flats (i.e. DBSS, Premium Apartments, Maisonettes, Apartments, and Type S1/S2). 47.2 per cent were ≥20 years. A record number of 71 flats were sold ≥ S$1 million last year. 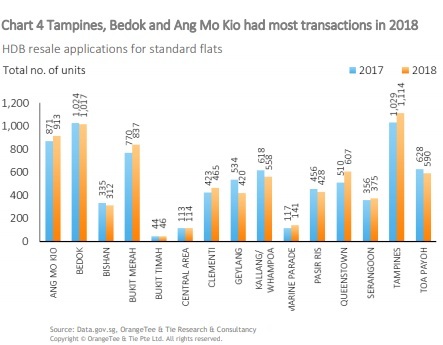 Although they constitute only 0.3 per cent of all HDB resale transactions last year, there seems to be a consistent uptrend in demand for such flats (Chart 3). 20 million-dollar flats were transacted in Q4 2018 despite the typical year-end marketing slowdown. The number sold was above the million-dollarsales in Q1 (12 units) and Q2 (17 units). The third priciest flat on record was also transacted in October last year at S$1,168,000 for a 106 sqm 5 room flat at Duxton at Pinnacle. A 112 sqm 5 room standard flat at Boon Tiong Road and a 114 sqm 5 room DBSS at Toa Payoh were sold for S$1.15 million in December. 16 standard flats were sold at ≥1m last year, mostly at Boon Tiong Road (7 flats), Commonwealth Drive (3 flats) and Holland area (3 flats). 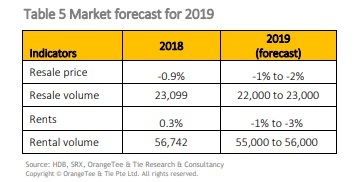 The uptrend in demand is poised to continue this year as more HDB flats in prime locations like Queenstown (758 units), Bukit Merah (2,966 units) and Ang Mo Kio (256 units) are reaching their five year MOP (Chart 9 of Page 9) and can be put up for resale. About 3,500 DBSS will also be reaching their MOP this year. The most active towns were Tampines, Bedok and Ang Mo Kio which saw the most transactions last year. Standard flats in Marine Parade saw the largest y-o-y increase in transaction volume in 2018 (20.5 per cent), followed by Queenstown (19.0 per cent) and Clementi (9.9 per cent). Geylang saw the largest drop (-21.3 per cent) in transactions (Chart 4). 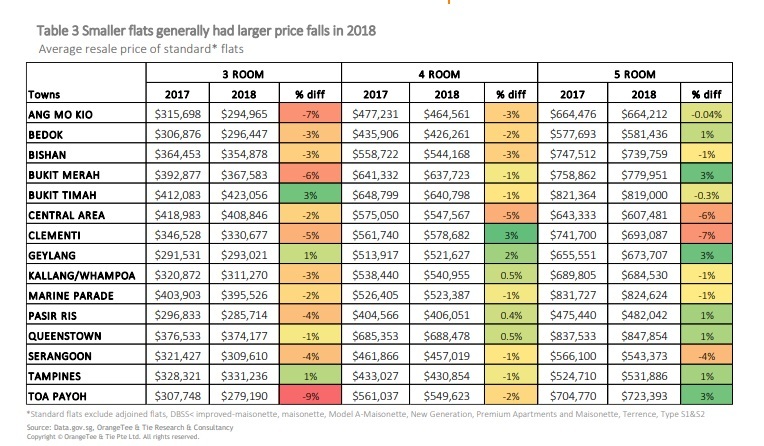 Prices fell across most towns for 3- room flats (except Bukit Timah, Geylang and Tampines) while they rose for half the mature towns for 5- room flats y-o-y in 2018 (Table 3). Price movement was more marginal for 4-room flats, fluctuating within a – 3 per cent to 3 per cent price change for most of the towns. The number of resale applications in Punggol rose the most by 47.0 per cent from 534 units to 785 units last year. This is followed by Sengkang (23.4 per cent) and Choa Chu Kang (22.1 per cent) (Chart 5). The number of HDB transactions is poised to rise further this year in Punggol and Sengkang as there will be many flats that will reach MOP this year and ready for resale. Many private condominiums will be reaching their 4- year SSD may also see many sellers putting up their units for resale which may spur more HDB owners to upgrade to private condominiums there. Despite the big supply of HDB flats in Punggol, the 4 and 5-room flats in the town saw the largest y-o-y price increase in 2018 of 3 per cent and 7 per cent respectively (Table 4). According to HDB, the number of approved applications to rent out HDB flats rose 2.3 per cent to 11,479 cases in 4Q 2018. Y-o-Y, the number of approved applications rose 1.8 per cent (Chart 7). 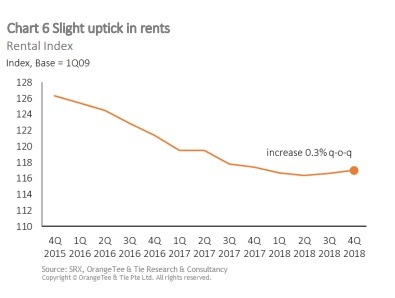 Using the SRX HDB rental index, rents saw a slight uptick of 0.3 per cent qo-q in Q4 2018. On a y-o-y basis (based on figures for last month of the quarter), rents slipped marginally by 0.3 per cent. (Chart 6). Based on HDB’s record of completed HDB residential developments, an estimated 26,723 flats (excl. DBSS) may be reaching their five-year MOP this year. This is a 58.3 per cent y-o-y increase. Another almost 50,000 flats may be reaching MOP in the next two years. Further, about 3,450 DBSS flats will be reaching MOP this year, in contrast with 800 in 2018 and 1,200 in 2017. Sengkang and Punggol may likely see an increased in HDB resale transactions this year with more than 10,000 flats reaching MOP this year. In the mature estates, Bukit Merah, Queenstown and Ang Mo Kio will see almost 4,000 HDB resale flats reaching MOP as well. Therefore, there could be more flats being sold above S$700,000 this year. The increased number of HDB resale flats last year could be a silver lining for the market. Demand for HDB resale flat may continue to be resilient this year and maybe supply-led as more than 26,000 HDB flats are reaching MOP this year and will be eligible for resale. These flats will also be eligible for rental, thus possibly uplifting the HDB leasing market. 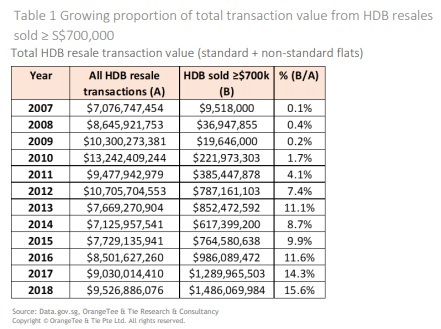 We estimate that between 22,000 and 23,000 HDB resale flats could be transacted this year, while the number of HDB leases could hover between 55,000 and 56, 000 flats (Table 5). 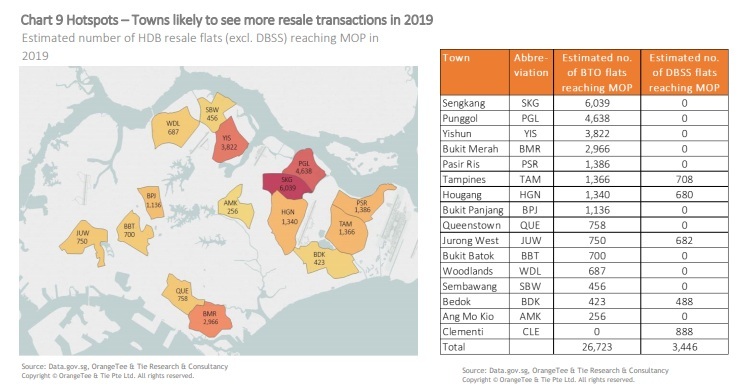 Areas like Punggol, Sengkang, Yishun, Bukit Merah, Pasir Ris and Tampines, may possibly see more resale and rental activities this year. Further, as many new condominiums in Punggol and Sengkang are reaching their fourth year after their OTP (option to purchase) date, where many sellers will no longer be subjected to the seller’s stamp duties, more condominium units could be put up for resale which may spur some HDB owners in these areas to sell their flats for upgrading. Price weakness may continue to affect some market segments, especially smaller and older flats due to the lease decay issue and growing supply of newer HDB resale flats in non-mature estates. Therefore, resale prices and rents may experience some downward pressure in selected towns. We estimate that the island-wide resale price may continue to fall but at a slower pace of between 1 and 2 percent, while rents may dip by 1 to 3 per cent for the whole of this year. 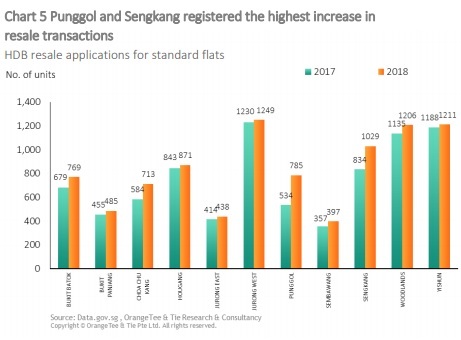 The total number of HDB resale transactions reached a new high in 2018, with the largest year-on-year increase seen in Punggol and Sengkang. The proportion of flats being sold at higher prices had grown exponentially as more flats were transacted at ≥ $700,000 and now constitute more than 15 per cent of the total HDB resale transaction value. Third priciest flat on record was sold in Q4 2018. New resale and rental hotspots may emerge as more than 26,000 flats will be reaching their Minimum Occupation Period (MOP) this year. Another 50,000 could be reaching their MOP in 2020-2021. 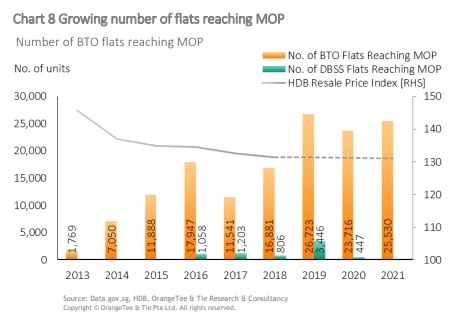 More million-dollar transactions could be expected as about 3,500 DBSS and 4,000 BTO flats would be reaching their five-year MOP this year.